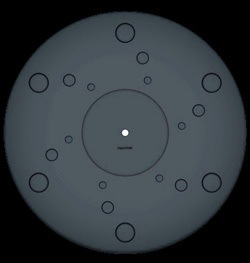 The original turntable mat, Oyaide “MJ-12”, is designed to trace the groove on the vinyl absolutely. The surface of MJ-12 is curved 1.0 degree which makes the record surface closely fit to MJ-12 by using a stabilizer (more than 300g is recommended). This corrects the warpage of an analogue record and makes the stylus moving stable. Furthermore, on the highly rigid aluminium disk coated by hard-alumite treatment, there are tuning holes which are arranged in spiral pattern for effective vibration attenuation. MJ-12 gives the whole new expression power to your turntable and you can hear the new sound pieces in your favourite analogue records. This unique and 0.7Kgm mat is ideal fit for the SL-1200 as the lip fits perfectly. We also use it on our SP-10. It gives extra mass and a complete elimination of any platter ringing. When you see it, you will want it! Inheriting the shape of MJ-12 above, it is made of butyl rubber which has excellent vibration damping properties. Due to its high friction coefficient and grippy material, it enhances the adhesion with the vinyl surface and ensures stable vinyl playbacks by its anti-slip property. 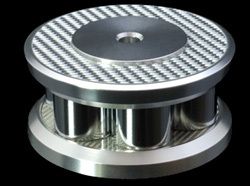 Tungsten, which has almost same specific weight with gold and known as anti-vibration material, is mixed into butyl rubber which has excellent low-repulsion force and vibration absorbing property. The tapered structure angled 1.0° from centre circle to the edge for correction of warping. 18 of tuning holes are arranged in spiral pattern for effective vibration attenuation. It comes with a really rather nice Stroboscopic disc and overhang gauge. This remarkable mat has a small undercut "lip" so that although it is a full 295mm diameter and hence will hold a 12" record properly, it will fit on a SL-1200, SP-10, Garrard 301 - 401 and any other turntable. STB-MS is the original vinyl stabilizer produced with innovation concepts. Furthermore, it can be used for big hole 45's by simply flipping it upside down. It enhances the tracing ability of the groove to the maximum. We love these to bits ! PCOCC-A is a core component of all PA series line-up and is a key factor for high-quality and high-performance only from Oyaide Electric. Each model of PA series has its own concept and identity individualized by materials and structures. 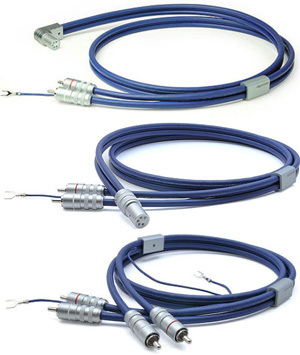 The PA-2075 coaxial cable is a parallel-layout structure designed to be compact and lightweight. In order to reduce conductor resistance and transmit weak analogue signal effectively, the overall diameter of the conductor strands was increased to 0.5sq. The high density spiral shielding structure is composed of PCOCC-A for its highly effective behaviour in an ultra compact layout. The semiconductor (carbon PVC) layer is provided for the purpose of eliminating static electricity without exerting any influence on the conductor. As an insulator, we selected high polymer polyethylene which has the same permittivity as Teflon but is halogen-free for audio application. The genuinely innovative product is produced by applying the latest materials and structures based on solid data. PA-2075 increases the enjoyment of your life with analogue audio.